You can now find us within Diamonds Camera, Video & Digital on Rundle Street, Adelaide. We still offer expert advice (from the same great staff! ), studio and pro, second hand, camera and lens hire, wholesale, camera training, camera courses, events, and repairs and insurance. Furthermore, we still specialise in assisting government, education, youth, professional photographers and other businesses in meeting their photographic needs. Not only this, but now we have great new training facilities and South Australia’s first Leica boutique! 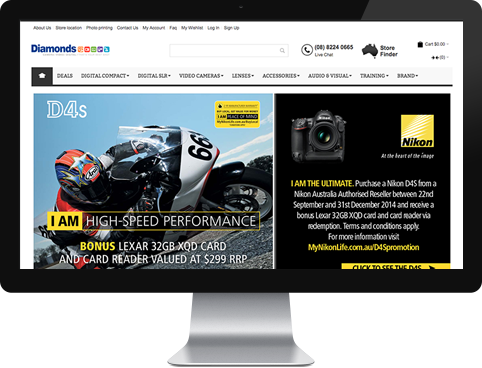 Photographic Wholesalers in Adelaide specialise in compact digital cameras, DSLRs, video cameras, lenses, studio and photographic accessories. Taking pride in dealing with professionals, government, schools, and businesses, we strive to provide a solution to your photographic needs.